If you're a barbarian looking to get the red blood pumping through your veins, read this. It'll tick you off faster than a Levi Johnston article. Remember Steve Schmidt? Yeah, he couldn't win a game of cards against a blind guy. This dude seems to think that Palin would most certainly lose in 2012. She apparently is divisive and has done nothing to broaden her appeal. Can somebody, anybody, please give these party boys their testosterone back? I don't know who stole it, but it's getting extremely annoying. This is typical of the party boys. All they care about is winning elections, they have no real principles. Ironically, this guarantees that they'll never win an election. I honestly don't care if she wins or not. I just want someone, anyone, to stand for something for a change. Levi's a tragic figure. His personal life fell apart in the wake of the election: his dad left home, his sister turned scumbag, his fiance dumped him, he lost his job, and his mom went to jail. Not to mention the fact that the media wouldn't leave him alone. His family's attorney even admitted that the media outlets would call asking Levi to give them dirt on the Palins. While he was Bristol's fiance, he had the structure of some kind of family around him, but that obviously didn't last. When Rex Butler and Tank Jones (who seems to think that all mothers are horrible human beings) came along, I can see how the yet-to-be-fully-formed logic of an eighteen-year-old could be twisted to blame the Palins for all his problems. After all, according to "Team Levi," Levi might as well just cut his losses and get whatever he can out of it. His own family fell apart, and his adoptive family relationship got strained because he was fightingwith Bristol. Left with no bearings, he went to the only people who said they were on his side. Of course, they're really not; they're just using him, but he doesn't see that yet. Yes, he's a Judas, Brutus, and Benedict Arnold. He sold out his family to save his own hide. But in the end, he is most wretched. I think he'll wake up one day and realize that he stuck a knife in the back of the only true friends he ever had. When that day comes, he'll have a choice to make. 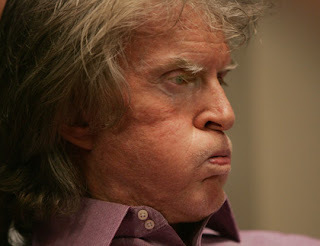 Now, back to who Levi reminds me of. 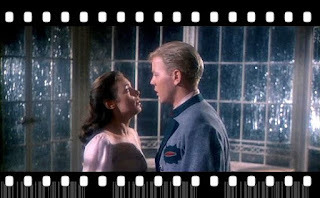 Remember the Sound of Music? I'll admit I have no idea what I'm talking about; I'm just going off of snippets I've been hearing on the news about Iran. Apparently that nutjob over there has a couple nuclear facilities going, he's testing missiles, he hates Israel, and the rest of the world is twiddling its thumbs and wringing its hands going, "Oh, my goodness, what do we do?" Meanwhile the people of Iran are yelling as loud as they can, "He doesn't speak for us!" Here's a novel idea: how about we pinpoint the nuclear sites, his military sites, where the mullahs live, and where Ahmadinejad lives and with no warning bomb the daylights out of them all simultaneously. Then we make it clear that if anybody else (dictatorwise) moves, they're next. Then we say, "Hey, Iranians. You wanted a free Iran, here you go. If you elect another nutjob, he'll get the same thing. Here's your chance; don't waste it. We'll help you out however we can," and then leave. There. Problem solved. I know it's more complicated than that, but this garbage that we've got now is the Neville Chamberlain approach. That way leads to World War. If we'd just bombed the batsnot out of Hitler when he went after the Sudetenland, the Holocaust wouldn't have happened. Dictators are never satisfied. They won't stop until you kill them. I still probably would've thought it was a typo. You Sarah Palin fans/haters who thought you had until next spring to buy and then read at least the first part of Sarah Palin's book need to change your plans. Pronto! Grab your lawn chair and get down to the local bookstore immediately. The book is so delicious and revealing -- according to the publisher, who might just have a stake in ginning up excitement over this -- they are moving up the publication date. "Going Rogue: An American Life" will now go on sale on Nov. 17. So everyone can get copies as Thanksgiving presents. Harper publisher Jonathan Burnham says the ex-governor obviously invested herself deeply -- and also quite quickly -- in penning the 400-page volume, and it contains "fascinating details." Some of which, no doubt, will not be so fascinating to some within the failed campaign of Arizona Sen. John McCain, who picked her as the first GOP female on a presidential ticket in an obvious bid for the Arctic vote. Many in the mainstream media will also be eager to see how the Republican hockey mom praises them for their objective portrayals of her -- and, indeed, her entire family -- all last fall.First stop on the book promotion tour, no doubt: CBS to chat with David L. and Katie C. Harper's says it's ordered a whopping advance printing of 1.5 million copies. But that still means that more than 300 million Americans will have to share copies. Or perhaps they'll print more. "Governor Palin has been unbelievably conscientious and hands-on at every stage, investing herself deeply and passionately in this project," said Jonathan Burnham, publisher of Harper. "It's her words, her life, and it's all there in full and fascinating detail." Palin's book, her first, will be 400 pages, said Burnham, who called the fall "the best possible time for a major book of this kind." The book now has a title, one fitting for a public figure known for the unexpected — "Going Rogue: An American Life." Palin, 45, spent weeks in San Diego shortly after leaving office and worked on the manuscript with collaborator Lynn Vincent, a person close to her said. She was joined in San Diego by her family and her top aide, Meghan Stapleton, then spent several weeks in New York working around the clock with editors at Harper, said the person, who wasn't authorized to comment and asked not to be identified. Publication is being moved up from spring to Nov. 17 in order to catch the holiday book-buying season. The former Alaska governor has been in huge demand as a speaker, and continues to harvest a bounty of media attention. Palin had a deadline of Sept. 15 for her manuscript and turned it in a bit early. Copy-editing and fact-checking are now underway in a race to meet the crash publishing schedule, which has been accelerated four or five months because of the huge anticipated demand. After Palin left office on July 26, she went with her husband, Todd, and her children to San Diego, the home of her collaborator, Lynn Vincent, and worked on the book for several weeks. Later, Palin spent several days in New York, going over the final edits. Palin mischievously embraced the phrase “going rogue” at the end of her troubled campaign for vice president on the ticket headed by Sen. John McCain (R-Ariz.). The phrase has its roots in an Oct. 20 story by Slate's John Dickerson, with the lead: "Has Sarah Palin "gone rogue"?" So, for all the doubters out there who were crying, "Where's Sarah Palin?" Now ya know. The frustrations of the founding fathers weren't just the negative things like excessive taxation, it was also that the British Empire wouldn't allow the American colonies to do good things. Did you know that between 1774 and 1775 the first anti-slavery society was founded in the American colonies? Benjamin Rush, Thomas Paine, and Ben Franklin were among its supporters. Here's Thomas Paine's essay on the subject. Great Britain frowned on the movement because the British Empire had slavery. Frustration in the colonies was growing on many fronts. Alaska became a state in 1959. Since Jimmy Carter they've been trying to make headway with things like resource development in ANWR and other places, but the federal government keeps getting in their way. Alaskans are very independent. The Alaskan Independence Party is the largest third party of any of the states. "Tax" in Alaska is practically a dirty word, and you better not tell an Alaskan what to do. I don't think it's a mistake that the star shining brightest in politics right now is an Alaskan. Is it a coincidence that just when it seems that the Lower 48 (not all, but enough) have forgotten who we are, here comes someone who was raised with the old frontier spirit of ruggedness and independence to remind us? Alaska is our lode state, just as Polaris is our lode star. As Palin is so fond of saying, "Under this great North Star" we are shown the way back home. Now, does this mean that Alaska is perfect? Of course not. Liberals seem to delight in pointing out what's wrong with Alaska, what's wrong with this country, what's wrong with Americans in general. I know full well we've got some things to work on, but don't they ever see the good things? They're Puddleglums, only instead of being endearing they're arrogant and spiteful. No thanks. The founding principles of this country are still held dear in the Last Frontier. That's what makes them our lode state right now. When I say I love my country, I'm not saying that bad things don't happen in it. My country is more than the sum of its events; it is an idea. That's what America is; it's a principle, a desire, an ideal. It is freedom and equality; principles. Have we always lived up to those ideals? No. Alas, we are human. But the principles themselves are no dimmer now than they were in 1776. That is what we cling to, and that is what the Far Left will never understand. They don't believe in those principles like we do. There is a fundamental disconnect. The George Soroses of this world don't believe in the idea that is America. I have more in common with the people of Iran fighting in the streets for some scrap of freedom than I do with extreme left liberals like this man and his cohorts. I've often said that if things get bad to the point of absolute tyranny, my last-ditch option is to move to Alaska and secede. Many Alaskans are going "No!" right now because their permanent fund checks will suffer (the more residents, the less money there is to go around). Listen, if I can be free, y'all can keep your checks. I won't ask for one. Now, I don't think we're anywhere near that point. This good ole' United States has got a lot of life left in it, and I'm nowhere near done fighting for it just yet. Until we get our bearings I'll just borrow some of that good old Alaskan spirit and use it to patch up some of the tears in my flag. Another kind of American entertainer who customized her act for an Asian audience this past week was Sarah Palin. At first glance it seemed a set-up for disaster. Fund-managers, for their part, are a generally nervous crowd. They especially chafe about ignorant American political figures that might shoot off their mouths and stumble us all into an East-West confrontation. Their big worry, of course, is the U.S.-China relationship. 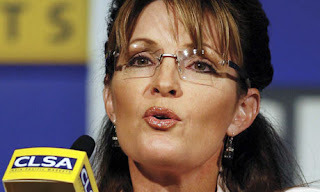 Enter on center stage the inimitable Palin: What could the former Alaska governor possibly know about China? From her perch in Alaska, after all, she could not claim much special knowledge because she couldn't actually espy its land mass, as she had said she could of Russia, this advantage awarding her a Ph.D. in Russian studies, in her own estimation. Alas for the Palin critics, the would-be lady Presidential candidate offered a largely defensible and common-sensible outline of views. She reaffirmed the rising role of Asia, the importance of trying hard to understand China on its own terms, and the high stakes involved if the result were failure. And to the astonishment (if not consternation) of the Singapore government, she even managed to quote that "Asian wise man," as she described the legendary Lee Kuan Yew, 86, in defense of America's staying the course in Afghanistan: ``And Minister Lee knows, and I agree, that our success in Afghanistan will have consequences all over the world, including Asia. Our allies and our adversaries are watching to see if we have the staying power to protect our interests in Afghanistan." That's a position not everyone can blithely disagree with. In fact, the entire speech was easily her most mature exposition to date. So far so good. The author couldn't resist a couple backhanded swipes, what newspaper writer can't these days? I only have two pieces of advice for her, if she is interested in having them. One is to keep that speechwriter at all costs! The other is to never, ever depart from script if she can help it. Therein disaster lurks. Obviously the ambitious Palin still has much to learn. But hers wasn't such a bad show at all. Why, thank you. The press has gone from "Sarah Palin is the Devil incarnate!" to, "Well, she's not too bad." Baby steps. 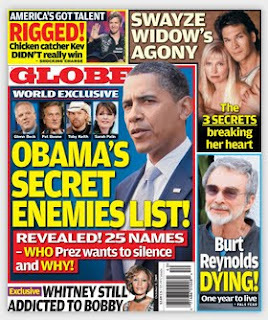 It's in Globe Magazine so I'm not taking it as Gospel, but according to the tabloid, Obama's got a hit list. And oh, looky who's on it, the one and only Sarah Palin. What a shock. This may be the only time in history I pick up a tabloid and give it a passing glance. Take one article with a large dose of salt before supper.